Is your business ready for an emergency fire code? We provide maintenance, repair, and fresh installation of a panic bar for commercial and industrial clients. A quality panic exit bar allows your employees and clients to evacuate the building securely. With this in mind, in the case of an emergency fire situation, customers should be able to evacuate the building and fast and safe. A panic bar/exit device is a device for quickly unlocking a door during emergency conditions. The mechanism consists of a spring-loaded metal bar fixed horizontally to the inside of an outward-opening door. When the lever is either pushed or depressed, it activates a mechanism. It unlatches the door allowing occupants to leave quickly from the building. Panic bars designed the same way in which you will always have a manual exit from the building, that is easy. Typically fire rated exit devices are used for interior doors while panic rated devices are used for exterior doors. Regardless, it is important that you check with your local fire and life safety as well as building code inspectors to determine the correct device for your door. If the door is heavily used, outside trim such as knob or lever handles can be used to locked or unlocked the door, and general access can be allowed. Push bar repair services in Allentown, Easton, and Bethlehem available 24 hours a day year’ round. That is to say; whenever you need an emergency commercial locksmith, we are ready for your call. A panic bar/exit device is one of the most commonly requested and used piece of hardware by commercial and industrial businesses. With this in mind, we proudly announce that our commercial locksmith help with any issue with your push bar or alarm panic bar. You see them on almost every building exit due to their ease of use and typical passing of fire code. Over the years, panic bar installation has become mandatory. There are many different types of emergency exit devices and LockTech24/7 can help you find the one piece of hardware that will fit your door perfectly. The proper installation of push bar by LockTech24/7’s commercial locksmith will allow people to pass through the security door quickly and safely. We can install a horizontal push bar or vertical push bar. Our locksmith technicians are practicing with real locks in different conditions. Our expert locksmiths can repair any commercial as well as installing high-security locks. We can also install lever-set, keypad lock, and many others. When you need an emergency locksmith, please call us anytime because we provide 24/7 locksmith services of all kind of emergencies. One of our wide commercial locksmith services is to re-key locks of push bars. It doesn’t matter if you have mortise lock or rim lock on your door connected by a trip to your push bar. 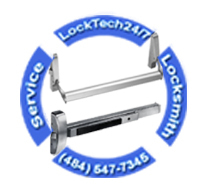 We, at LockTech24/7 provide re-key service to all locks, all push bars, and all alarmed panic bar. At the same time, when we service your push bar lock, we lubricate the mechanism and maintain other parts of your push bar. Re-keying a push bar lock is the cheapest way to go in order to change the key of your lock. 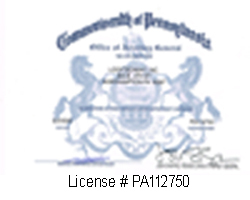 So if you need to change the key of a panic bar in Bethlehem PA, call the experts of LockTech24/7, cause no job is too big or too hard for us. During the time and out of wear and tear also a commercial lock can break. Sometimes, we’re able to repair your lock so it works like a new. In other cases, when your push bar lock is broken beyond repair, we can simply replace it with a new lock. Replacing a push bar lock can give you the advantage of upgrading your business security. With this in mind, we carry almost all high-security commercial locks. Whether you need to repair or replace a push bar lock, we’re here to help. LockTech24/7 commercial locksmith in Easton is ready to repair your push bar lock. As well as we’re ready in Bethlehem, Allentown, and the entire Lehigh Valley PA. Push Bar Repair at LockTech24/7 is the best solution for you!